Chopta is popularly known as Mini Switzerland. The best time to visit is from April to November. Chopta is also a popular destination during the winter months due to the Snowfall that the area experiences. Chopta is a small region of meadows and evergreen forest area which is a part of kedarnath wildlife sanctuary located in Uttarakhand state. The whole tour covers a swoop to the Chandrashila Peak, passing by the enchanting Deoriatal lake side, and opens up a gallery of stunning snow peaks all the way. Located at an altitude of 2438 metres, Deoria Tal is a beautiful fresh water lake. 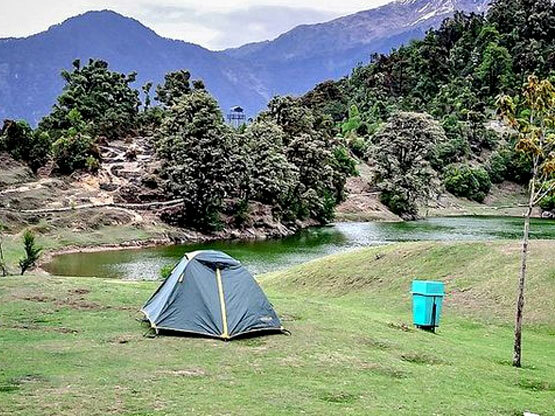 The lake is known for its lush green surroundings with snow-covered mountains in the backdrop and therefore, is a great site for camping. Tungnath is the highest Shiva temple in the world and is the highest of the five Panch Kedar temples located in the mountain range of Tunganath in Rudraprayag district. Chandrashila is summit of the Tungnath. It literally means "Moon Rock". It is located at a height of about 4,000 metres above sea level. Heart problem, high blood pressure, asthma, and epilepsy cannot be reconciled on this mission. The climber must not have the conditions mentioned above.